Remember Tim Hightower? Back in July of last year, the Redskins traded to pick him up in exchange for Vonnie Holliday. Right before the regular season, this trade was looking incredible and fans were thinking they had a running back that would lead them for the next few years. Unfortunately, that didn't pan out the way fans hoped. Hightower looked electric in the preseason. In the 3 games he played he rushed 26 times for 170 yards and 2 touchdowns (6.5 yards per carry). The buzz about Hightower was running high throughout the area and gave people something to be happy about during the whole Rex vs Beck drama. The regular season didn't pan out as well however as Hightower only rushed for 321 yards on 84 carries (3.8 yards per carry). He struggled a bit with lots of very short runs and 2 touchdowns in the 5 games he played in. (At least he didn't fumble!) 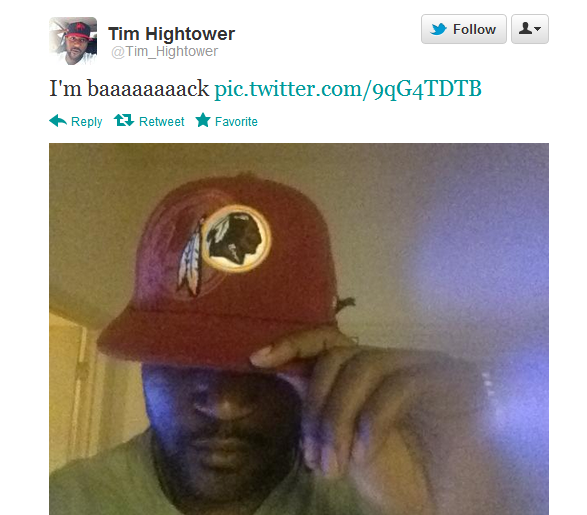 But Hightower's season ended prematurely after he tore his ACL in game 6 against the Panthers. During his re-cooperation stage, Hightower took to the mountains where he enjoyed hiking away from the trails with no compass or map. At one point him and his wife had to be rescued after getting lost on Camelback Mountain in Arizona. Last season with Hightower out, the Redskins saw two breakout seasons by rookies in Roy Helu and Evan Royster. The two rookies combined for 968 yards, Helu ran for 4.2 yards per carry and Royster went for 5.9. Hightower will return to try to compete for his starting job back, but we will have to see how he rebounds to the knee injury. Either way it looks to be a running back by committee next season, and Shanahan knows after last season that all three guys can be plugged in and perform.